What else is there for me to say? With Millais’ signature piece at the heart of this show and the likely effect that will have on visitor numbers, this retrospective risks being a one-trick pony. 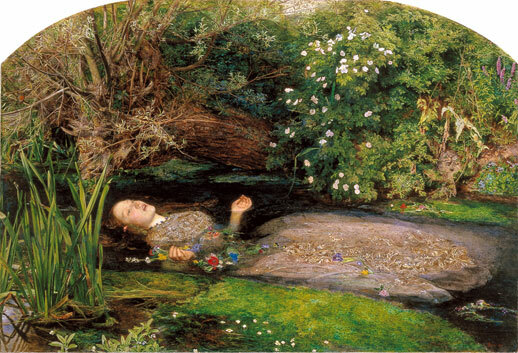 Thankfully, however, Millais’ greater body of work and the organizers’ treatment of it in this exhibition means that there is more to see than this illustration of the tragic heroine of Shakespeare’s Hamlet. From the moment of being confronted by a flawless drawing of a Grecian bust made when the artist was just nine years old, I found myself wondering how Millais viewed his talents. He was regarded as a precocious child, yet having been accepted into the Royal Academy schools in 1840 at the age of eleven he must have felt a burden: the burden of being too good for his age. The Woodman’s Daughter (1850-51) is a vivid painting in its unnatural greens and yet I couldn’t help wonder why the boy’s right arm appeared shorter in length than his left, seemingly wooden and twisted as if it weren’t his own. 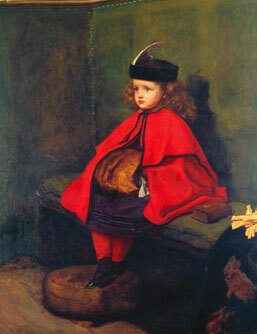 Millais’ decision to leave this boy’s arm in such an awkward and unnatural pose could have perhaps been in accordance with Pre-Raphaelite principles (naïve compositions often being one of the requirements) but is it not possible for such a young man to have simply suffered moments of idleness and be at odds with his ability? Born into a prominent family in Jersey in 1829, it was a curious decision of Millais’ to then focus on ordinary people trapped in situations of conflict such as in the paintings The Rescue (1855) and The Order of Release (1853). [I don’t understand the jump from his year/place of birth to the works of his early twenties…] Millais seemed determined to reach beyond the entertainment values of Shakespeare’s plays and strike a chord that would resonate in people’s hearts. The exhibition almost labels this change in direction as heroic yet Millais was not a man of the lower classes and so there must have been another reason for this new direction. His reputation at that point in time was very much in its ascendancy, so perhaps he simply felt a need to be grounded? This was also a time when Millais fell in love with the wife of John Ruskin — his patron — and so one can perhaps sense that the struggles between heart and mind might have led him towards a more humble choice of subject matter. Millais’ character continued to hold my attention throughout the remaining works in the exhibition, which reveal a man more at ease with his own talents and pressures. A very wicked sense of irony creeps into paintings such as My First Sermon (1863) and later My Second Sermon (1863-4) — shown together here, they are sure to make most people giggle in the hushed silence of the museum. Likewise Duckling (1869) is titled after the ducks located at the bottom of the picture and yet the focal point of the picture is a young girl, pretty in her own way and yet perhaps not pretty enough for some. The allusion to the story of the ugly ducking may sound cruel but there is a dark side to Millais’ wit that recurs throughout his work. Although the stories and legends that inspired him have receded into the depths of cultural consciousness, his sense of humour still transcends the barriers of class and nationality. Therefore, it is simply enough to fall in love first and then laugh along with such paintings. This exhibition features enough of them to let you do just that. 1 A Visit to the Royal Academy (1852) The Star of Freedom Newspaper, Leeds, England. Saturday May 29, 1852, Issue 4.